What kinds of trips does Jubel plan? Who can travel with Jubel? Why is Jubel better than the competition? How do surprise and non-surprise trips work with Jubel? What’s the best way to take Jubel’s travel survey? When’s the best time to book a trip with Jubel? What are your starting prices? What’s included in a Jubel trip? Are activities included in my Jubel Journey? Is Jubel my cheapest option? If you’re dealing with any of these challenges, Jubel is the solution you need. We’ll craft you a trip that you may have never even considered, while saving you the frustration and time of planning and booking it all yourself. Fully personalized to your ideal experience and budget, Jubel ensures that everyone traveling with you gets that unique and memorable trip you’ve been dreaming about. What kind of trips does Jubel plan? Jubel specializes in crafting private, fully personalized, multi-destination experiential trips around the world. We pride ourselves on sourcing remarkable destinations that have yet to be discovered by mass tourism and providing one of a kind experiences to our customers. We are not about creating by the minute travel itineraries, instead, we allow you to have the freedom to set your own pace and choose what you will do, eat, and see in each destination. We also believe there is a perfect balance between what is planned and what is spontaneous - so we make sure to allow our customers the option to be struck with awe by turning their trips into surprise adventures. Jubel has helped customers from all over the world with a wide variety of trips, including couple’s getaways, honeymoons, solo trips for both men and women, trips for groups of friends, anniversary trips, and family trips. The only common thread here is that our incredible customers are young or young at heart, have a strong curiosity for the world, and a desire to step out of their comfort zone to experience something new. 100% Tailored Routes - No group packages or cookie cutter trips. Advanced technology helps our travel specialists sort through a proprietary database of close to 1,000 destinations world-wide, to match you with a journey that perfectly fits your specific tastes, budget, and preferences. Budget First for Best Value - We offer budget-first trip planning, which means we consider cost-effective travel logistics, exchange rates, and experiences you will love when crafting your trip. The experience will match your budget while giving you the best bang-for-your-buck. Vetted Destinations Around The World - Each Jubel destination has been hand-picked to provide you with an extraordinary experience, whether you choose to travel off the beaten path or stick to the tried and true classics. Jubel Atlas’ In-Site Recommendations - Before departure, we'll send you a destination guide with your itinerary, important information, and tips, along with our curated list of handpicked recommendations for things to see, eat, drink and do. Experienced Team - Our travel specialist team has over twelve years of experience, represents nine nationalities, has lived and worked in 25 countries, and traveled to over 60! You’ll be assigned a lead specialist, but your trip will be crafted with our collective knowledge. First, you’ll fill out our travel survey as completely and as thoroughly as possible. In the survey, let us know if you want a surprise trip, and if so, to what extent (you can choose to only know the country, the continent or keep the trip a complete surprise) or if you want to know everything. We’ll then reach out to you via e-mail (or phone if you prefer) and have a short conversation to confirm details and get a better sense of what you are looking for. After your conversation with your lead travel specialist, you will receive a proposal in approximately 2-3 business days (although this could take longer if you are traveling to a remote location where suppliers are slow to respond). The non-surprise proposals will reveal the exact destinations and the hotels you’ll be staying at. Alternatively, the surprise proposals give you general descriptions (and photos) of the destinations to give you a sense of the places you’ll be visiting, without spoiling the surprise. Finally, about a month before take-off, you will receive your Jubel Atlas. If you are taking a surprise trip, a physical envelope will be sent to your home. Inside that envelope, there will be a series of smaller envelopes revealing each of your destinations. Non-surprise travelers will receive a digital Jubel Atlas in pdf format. When taking our travel survey, you’ll be asked to tell us a bit about yourself and the travel experience you are seeking. We recommend that you take your time and put some serious thought into it, as the answers you provide will become the building blocks for your trip. The more information you can give us about the kind of trip you are looking for and the type of traveler you are, the better! We often find that, when filling out your survey, it really helps to put away your phone, turn off the tv, get comfortable in a quiet space, maybe even close your eyes and meditate upon the questions. Imagine what your ideal travel experience looks like and share this with us. Depending on your destination, we usually find that the best time to book your trip is about 3 - 6 months out from your travel dates. At this point, flight schedules will be published and oftentimes hotels and activity suppliers will still have discounted pricing. However, if you’ll be traveling during a destination’s peak season, it’s best to book even further in advance to avoid hotels, transportation, or activities from selling out. Please note that we do request a minimum of four weeks lead time before your departure so we can guarantee our high standard of quality. Depends what your budget is! 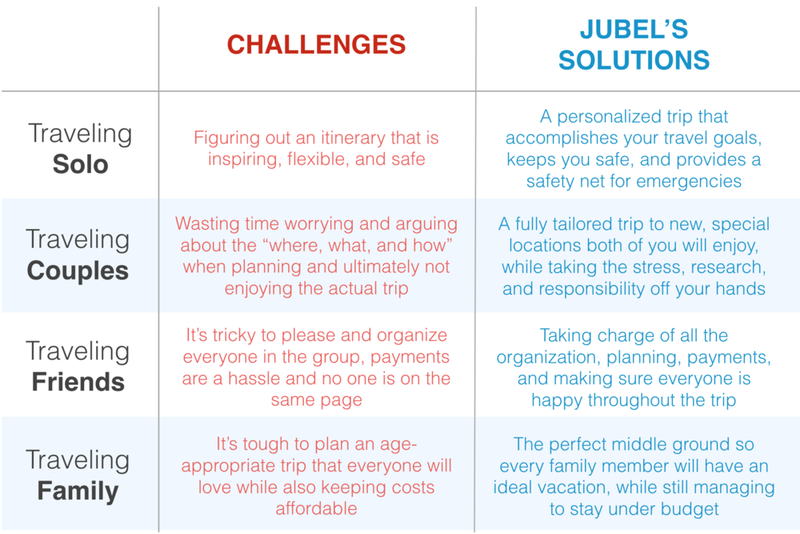 Jubel makes sure to stick to how much you want to spend and optimizes your trip so you can have the best experience within your price range. Unlike traditional travel agencies, we can cater to any budget and stick to our fixed planning fees, so you can always know what to expect. Generally speaking though, we do require a minimum budget of around $700 per person, per week (or $500 per person, per week for European clients traveling within the continent). Flights, Accommodations, & Transfers: The way we work is that Jubel books your flights, hotels, and transfers using the budget you provided in your travel survey. Your trip proposal will also include suggestions for things to see and do in each destination. Activities (Optional): Any activities you wish to book ahead of time will be included in your second deposit — as flights and hotels can sell out in a matter of minutes, we like to get these locked in at the soonest and focus on your activities next. Jubel Atlas: Before you depart, we will send you a Jubel Atlas with our recommendations for things to see, do, eat and drink in each destination. That way, you can choose what you’d like to do on the spot. Without a fixed schedule, you’re free to set your own pace as you go along. Customer support 24/7: We’ll be there with you every step of the way. From the moment you take off all the way through your return home, Jubel is available to help out with any hiccups that may arise along the way. Concierge services: We’re happy to help out with anything you need during your trip. Whether that be making restaurant reservations, arranging transportation, or recommending a great bar -- we’ve got you covered. Money-back guarantee: Even though it has never happened before, in the highly unlikely case that we make a mistake when booking your trip, we’ll work to fix everything at our expense or refund all necessary damages. This is totally up to you. In your proposal, you’ll see a list of activity suggestions for each destination on your trip, to give you an idea of the kinds of options available in each location. As well, before you depart, you’ll receive your Jubel Atlas, which will contain more information about available activities and tours, including recommended operators and contact information, so you can easily book these experiences yourself once you are on the ground. However, if you’d prefer to get your activities booked before your departure, we’d be more than happy to assist you with that as well -- simply let us know what interests you. The one exception here is traveling during high season or to destinations where a particular experience tends to sell out many months in advance. In these cases, we'll let you know that we highly recommend booking activities in advance so you don’t risk missing out on anything worthwhile. About 3-4 weeks before departure, you will receive your personalized Jubel Atlas - a package (either physical or digital) that includes all of the necessary information for your trip to run smoothly. A ‘Best Practices’ section, which explains important information about safety, health, tipping, driving, and the laws of your country of travel. Your full itinerary and confirmations. And, a favorite among Jubel travelers, a curated list of cutting-edge recommendations on where to eat, drink, party, and what to see and do in each destination. Jubel Atlas’ for surprise trips are sent physically, and each new destination is concealed in it’s own, dated envelope in order to keep each destination a surprise. Non-surprise travelers receive a digital pdf Jubel Atlas with all the information. Depends on what you mean by cheapest option. Depending on whether your trip will be a surprise or non-surprise, Jubel’s pricing structure varies slightly. For all trips, Jubel sticks to the budget you provide. For non-surprise trips, the total cost includes flights, transfers, accommodations, all taxes and fees, and a service fee of 12% + 3% credit card fee, that can be avoided with a bank deposit. This total also includes concierge services and customer support 24/7. With these trips, you can opt out of paying for our Jubel Atlases (each destination guide costs $150). However, the guides are highly recommended and have been a top aspect of Jubel trips for most of our clients. The price for all surprise trips includes flights, transfers, accommodations, all taxes and fees, and a service fee of 17% + 3% credit card fee that can be avoided with direct deposit, which includes concierge services, customer support 24/7, destination guides for ALL destinations, and shipping costs of the package. If, for some reason, you are unable to travel, Jubel will work with you and our suppliers to make any necessary cancellations and issue all possible refunds. The trickiest part about cancellations is working with airlines. Most airlines only offer a 24-hour cancellation policy and will not provide any refund after this time period. Most hotels and activity suppliers, however, have a more flexible cancellation policy. Should you be unable to travel, we'll get in touch with our suppliers to try and get you the greatest refund possible, but cannot guarantee a full refund. Please also note that the closer you get to your departure date, the harder it becomes to attain refunds. Many hotels have strict cancellation policies of a couple of days up to one month before arrival so, if you need to cancel, it’s best to do so at least a month in advance, if possible.